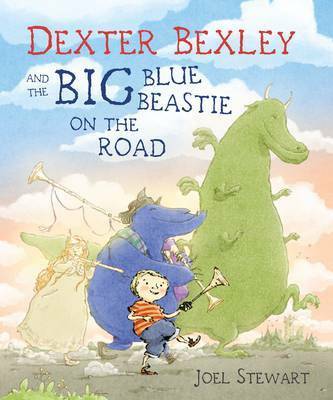 Today's Picture Book Saturday features Joel Stewart's fabulous Dexter Bexley and the Big Blue Beastie on the Road. The book opens with this great image of Dexter and the Beastie standing on the roofs of a town, hooting and tooting on their horns. It is night time and the stars and half moon is out. They are kicking up a racket and an angry speech bubble from a garret tells them to Be Quiet! 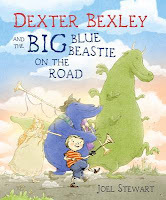 By refusing to Be Quiet and To Behave, Dexter and the Beastie get thrown out of town. Straight out, into the deep dark scary forest. They don't stay frightened for very long. They walk along, tooting and hooting on their horns and trumpets when they unexpectedly come across the tremendously charing Sir Percy Pecket who loves their hooting and asks them to assist in waking up his Beloved, the Princess Philippina. The Princess awakes and like Sir Percy she adores the hooting and joins in with her flute. But then the Princess asks Sir Percy if he's taken care of that pesky dragon problem. Sadly, he did not and so Dexter, the Princess and Beastie all set off to give the Frightful Dragon what for. Only, it turns out the Dragon is actually quite cool and he learns to tapdance to their tunes. Well, the story continues apace, with the Princess, Dexter and Beastie and the Dragon giving performance here there and everywhere. Until they realise they just cannot stop! Needless to say, this is a great picture book. The language is wonderful and the illustrations are quirky and fun and I quite would love a Big Blue Beastie of my own. Now, please? Their adventures are over the top, loud and funny and they meet unexpected characters who act in charming and eccentric ways. It's a book about friendship and music, packed with comedy and giggles. 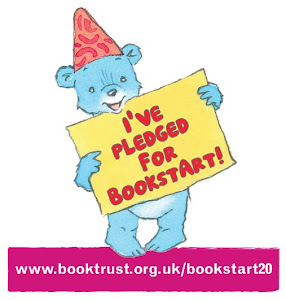 I loved it and can highly recommend it to readers both very small and very old. I like the sound of this one! Sounds very funny.